HotKanji and HotKana were the first really serious Java projects I worked on. The year was 1997. Or thereabouts. A couple of my friends at Uni High had started writing a kana flashcard applet in Java. I had recently become acquainted with Java, and I was generally interested in Japanese, so we teamed up to start writing a better version. I don't remember the details, but the team basically comprised me, Joseph Smarr, Pedro DeRose, and Michael Baym. 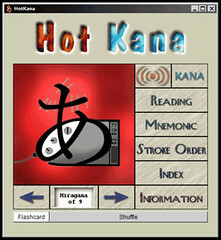 Our first usable piece of software was HotKana. We were initially doing it just for fun—as a learning exercise. However, the value of the idea as an aide to classroom instruction was obvious. We talked to the folks running the Japanese program at Uni High—at the time, Tomuson-sensei (a.k.a. Chris Thompson), head of the Center for Improvement of Teaching Japanese (CITJ), and Ito-sensei (a.k.a. Hiroko Ito)—and they were interested. So we started to take it a lot more seriously. We drafted Joseph's younger brother, Benjy, to draw the mnemonic images for the kana, and we found a native Japanese speaker to record the sounds for us (was this perhaps Ito-sensei?). Once we'd made significant progress on the kana—and, honestly, gotten rather bored with them—we decided to tackle the vastly larger and more complicated set of kanji. This was a major effort. We spent countless hours, holed up in the Smarrs' basement, coding relentlessly. (We also enjoyed the high bandwidth, great music, and endless supply of Mountain Dew, chips, and salsa.) HotKanji was the product of these many months of labor. HotKanji was a surprisingly complete product. It included images, stroke orders, readings, meanings, radical numbers, and even frequencies for all 1,945 Joyo kanji. I did the vast majority of the data entry via KanjiCreator, a piece of software we wrote to facilitate management of the data related to each kanji. Though we didn't get around to putting in compounds and sentences for all of the kanji, the ability to do so exists. The software, while quite usable as a dictionary-style reference, was still intended to be a classroom tool. HotKanji deals with sets of kanji, for example, you might put each weekly lesson's kanji into a set and distribute it to your students. You can search the set (or the whole dictionary) by nearly any kind of information and print out practice or quiz sheets for the set. 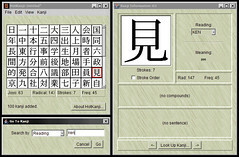 The last effort to develop and extend HotKanji was made by Pedro and me during our second year at UIUC. We took an independent study in the East Asian Languages and Cultures department in which we received some credit for our past work and some credit for developing the skeleton of a successor, tentatively named Jikyo. 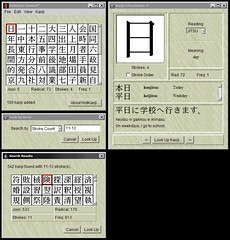 Jikyo was to provide substantially better dictionary and reference capabilities while sacrificing (or perhaps merely reusing) HotKanji's classroom, instructional features.